I do not make international calls, use my phone on roaming or download anything. Then why is my mobile bill so high?" You must have heard other people say this, or said it yourself, many times. What do you do when you get an unreasonably high bill? Usually, in a fit of rage, you threaten to change the service provider. Immediately, the provider places a promotional offer, as no one wants to lose a customer in this fiercely competitive market. For a while, you are happy. But this does not last and after a few months the bill starts going up again. You are angry but this time you decide to live with it. This is a mistake. For if you add your digital bills-going by the saying that a penny saved is a penny earned-you will realise how much you can save if your are careful. Consider this. If you save Rs 1,000 every month, you will have an extra Rs 3.5 lakh in 15 years if we assume an annual interest rate of 8%. But the question you must be asking is, how can I do this? It's easy. First, to control your mobile bill, or for that matter any bill, know your needs. How much data do you use? How is it charged? And, of course, how much of it is for free? Understanding your needs and choosing a plan accordingly can go a long way in reducing your bills. Here are some tips on trimming your digital bills. You may not be downloading heavy files, but if your internet connection is on 24/7 and you regularly check websites or read magazines and newspapers on your phone, you may be consuming more data than you think. You can reduce the bill by simply opting for the right plan. New-Delhi based Piyush, for instance, managed to cut his bill by almost half. His old plan used to offer free internet up to 300 mb and charged three paise per 10 kb after that. 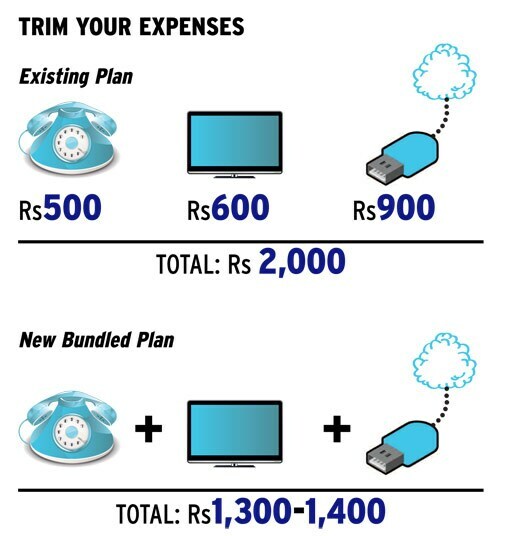 On a friend's advice, he switched to a plan that offered one gb at a flat rate of Rs 250. As his usage was more than 300 mb but less than one gb, this lowered the bill by almost 50%. Piyush, says, "My mobile's 'data use' application showed that I was consuming much more than what my plan gave me at a flat rate. I called up the service provider's customer care number and asked for plans that offered more data at a flat rate. I halved my bill by understanding what I need. Many of us do not know about the various features that come with our smart phones. One such application enables you limit data consumption. It sends you alerts when you are close to exhausting the limit. When the limit is hit, it switches off the internet connection. With so many free messenger services such as WhatsApp and Hike, make the best use of mobile data services. Moreover, keep a watch on promotional offers that come with these services. For example, Hike is giving you a chance to earn Rs 20 for each friend invited by you to join the service. So, you can earn talk time by making your friends join the service. Switch from mobile data service to Wi-Fi wherever you get this option-be it your home, office, airport lounge or coffee shop. More important, try to download stuff or update your software while on Wi-Fi, whose charges are usually lower "